With the new Blues Guitar Unleashed All Access Pass, you can have access to my entire library of (currently) over 830 video lessons, over 150 jam tracks in various keys, speeds, and styles, plus live workshops, the BGU Practice Generator, and more. So you’ll never have to go searching for the lessons you need ever again! When you started to play the blues, how long did you think it would take you? Did you think it would take as long as it has? Or did you think you’d be a little further along by now? And do you ever feel like, the more you learn, the less you understand? Or that you don’t have any idea where to go from here? But obviously more lessons doesn’t fix the problem… and I would go so far as to say it often makes things worse. And those lessons should use the same vocabulary, and have the same guiding principles and foundations behind them… and your lessons should be designed, from the beginning, to work together, so one lesson isn’t contradicting the previous lesson you just watched. But my lessons have proven themselves over the past 30 years to be effective. There are over 56,358 people around the world using my premium lessons, and many of those people get 2, 3, or some even 10 or more of my courses over time. And if the lessons are working for them, it’s a good bet they’ll work for you too. Plus, you’ll get access to my custom Practice Generator to help you create practice schedules and monitor your progress. It’s simple to use and incredibly helpful over time. You’ll also get exclusive access to a variety of live online workshops on things like Music Theory, Gear, Recording, Technique, and whatever else we feel like talking about. Finally, you’ll have access to the famous Blues Guitar Unleashed Member Forum where you can connect with other “BGU” members around the world. Ask questions, talk about gear, post photos of your latest New Guitar… or jump into the Virtual Jam Room and take a solo with friends. It’s About More Than Just Playing The Blues. But the basics and the foundations of playing guitar don’t change, no matter what style you’re playing. So in addition to all of the best selling Blues courses, there are courses for Beginners, courses for acoustic strumming, some fingerstyle lessons, and of course the entire Classic Rock Guitar Unleashed course is in there too. Or maybe you’ve always wanted to add some slide guitar to your vocabulary – there’s electric and acoustic slide lessons in open and standard tunings. And as more content and courses are added over time, you’ll have them, automatically, before anyone else. And you’ll know they are of the same high quality and feel as everything else because you know the source. Blues Guitar Unleashed – Now on version 2.0, still the best selling Blues Guitar learning system for anyone who wants to play the blues. Acoustic Blues Guitar Unleashed – Perfect if you want to play solo blues (as in, by yourself.) You actually can play the examples equally well on acoustic or electric guitar. Classic Rock Guitar Unleashed – Ready to rock? Everything you need to know to play like everyone from Lindsay Buckingham to David Gilmour. Beginning Blues Guitar - Perfect for beginners of any style, but the playing examples are primarily blues based. Strumming And Rhythm Mastery – So many strum patterns you’ll be able to play along with just about ANY song, and you’ll master your inner clock and counting along the way. Guitar Theory Made Useful – Music theory isn’t a mystery when you strip away the stuff that just doesn’t matter to anyone outside of classical music history professors. This is the cut-to-the-chase stuff you need to use music theory to your advantage every day. Pentatonic Scale & Technique Mastery – Get my personal program for building speed, control, and incredible knowledge of the pentatonic boxes. The Little Wing Lesson – The complete “how and why it works” behind one of the most famous songs ever. Modes Unleashed – Unravel the mystery of the modes and use them in any style of music effortlessly. CAGED Unleashed – CAGED is a system for looking at the fretboard in new and exciting ways. Imagine being able to just create any chord or scale you need as you need it – that’s the power of CAGED. Soloing Without Scales – Many people found me and Blues Guitar Unleashed through my famous “4 Note Solo” on YouTube. That 4 note solo pattern is just the tip of the iceberg and in this course you’ll get the whole enchilada. Chord By Chord Blues Soloing – Use the power of arpeggios to create better, more interesting and melodic solos over blues changes. 5 Easy Blues Solos And 5 MORE Easy Blues Solos – 10 complete plug-and-play solos you can learn and use quickly because they sound good and use nothing faster than an 1/8th note. Blues Gig In A Box Vol 1 & Vol 2 – 10 complete blues songs in the style of some of the most iconic blues songs in history. 52 Rhythm Fills And Variations – Stuck in a rhythmic rut? These options will keep you going for months and years to come. Major Minor Blues Shapes – Using my concept of “left facing” and “right facing” patterns, you’ll finally get good and switching back and forth between the major and minor blues sounds when you want to. The Blues Solo Construction Kit: Slow Blues and Shuffle Feel – Why settle for just a bunch of licks when you can add in phrasing and perfect options that always work, every time? 5 Easy Slide Solos – Electric slide guitar in the styles of Bonnie Raitt, Warren Haynes, Derek Trucks, and more. Introduction to Slide Guitar – Start here if you’ve never played slide and want to start in standard tuning. How To Build Blues Songs – Simply the best course I’ve ever seen on blues song form elements. You’ll learn how to take a 50 foot view of almost any blues song on the planet and learn it quickly – even if you’ve never heard it before. Acoustic Blues Song Lessons like the Spent Money Blues and Traveling Blues – If you just want to play a song, these 2 are great and very much in the style of some classic acoustic favorites like Eric Clapton would play. Jam Tracks – There are so many jam tracks I can’t even count them all. You’ll have 29 Blues Jam Tracks, Ultimate Blues Jams Volumes 1 and 2, 5x5 Jam Tracks, plus most of the courses have jam tracks that go with them as well. And there’s more, but to try and list them all would get a little silly because you’ll also have access to courses you can’t even buy like the BGU Insiders Vault, and Solos From The Masters where I walk you through a solo by guitar players like Freddie King, Albert King, Peter Green, and more. Now, if you think that’s a whole lot of goodness for your guitar playing, you’re right… and it’s stuff that you can rely on, day in and day out, to make you a better guitar player. But, it gets better because you’re also getting. Then, you can use the PG to track your progress using the timer and day calendar markers… and finally you can use the tracker “TV” icon to go straight to the lesson you are working on without having to search for it. It makes your practice incredibly efficient and lets you keep track of your stats and goals so you can really see your progress over time. If you’ve ever struggled to keep your lessons straight, to remember what to practice on for any given day, or to have a way to actually see your progress over time… then the Practice Generator is like a breath of fresh air. I love to “go live” with you and talk about stuff like Theory, Gear, Technique, and whatever else we come up with. So you can expect several live sessions every month where you can ask me questions directly, plus I’ll archive the recordings for you as well so you can refer back to them. Want to learn about recording your guitar? We can do that. Want to know more about your hand position or posture? We can do that too. Have a tone in your head that you just can’t figure out how to get? I’d love to help and we can talk about that as well. Or maybe, there’s a song that you’d love to solo over, but for some reason nothing you try sounds just right. We can analyze the chords together and come up with a plan of attack for that solo, together, live. The sky is the limit! There’s no way I can fully describe to you the “BGU Family,” but it is exactly that. I’m a member of many guitar forums around the internet, and there is not a single one with a more supportive group of people who just want to have a great time and improve their playing. You could be thinking about something at 2:00 in the morning on a Thursday, and someone will be on the forum – it’s crazy! Got a new song you just wrote? Post it up and see what folks think about it. Can’t figure out exactly how to count out something in a lesson? Just ask and the answer will come in, usually, within hours. The best part is that you’re never, ever, left alone to fend for yourself. If you want to learn to play better – we want to welcome you to the family and help you along the path as much as we possibly can. In fact, over the years I’ve heard from hundreds of students at live events and via email and posts on the forum that they consider the Blues Guitar Unleashed Member Forum to be worth more than all of the courses they’ve bought, combined! The “cost” of the Blues Guitar Unleashed All Access Pass is $29 per month, and you’ll have online access to all of the videos, audio, and manuals as I’ve described. After the first month, you’ll continue to be billed $29 per month until you decide to cancel your membership, at which point you’ll obviously no longer be able to access the videos and lessons. I looked at how much you would have spent if you bought every course I released last year… and you would have spent $585! So even if the All Access Pass was $40 per month, you’d still save some money. But, admittedly, this is something new I’m trying and there may be a couple of bumps in the road as we get it rolling – not that it won’t be fun, we’ll have a blast, but hiccups occur and I know that. So to get this up and running, not only did I cut the price in half but I added in the Practice Generator and the Live Workshops – so $29 should be a no-brainer for what you’re getting. Aside from the fact that, if you keep floundering around you won’t actually get better – at some point we’ll be off and running and the All Access Pass will go to a more reasonable price point, closer to $30 per month. You know, I’ve heard it said that the best plan is the one you stick with… and that is most definitely true where guitar lessons are concerned. If my style of teaching connects for you, then you’re much more likely to stick with it, and that’s when you’ll see results. As you continue to keep your All Access Pass Membership, you’ll earn a “Golden Ticket” which will allow you to choose one of my courses and you can own it… even if your All Access Pass expires. You’ll see your first Golden Ticket just 60 days after you join, and you’ll continue to see them each 60 days thereafter. But I’m so convinced that once you see the benefits of being an All Access Pass holder, you’ll want to keep your membership for years to come. If, for any reason, you don’t love your All Access Pass, just let me or my helpdesk know and you’ll get a full refund on your previous payment – no questions asked. And if you decide to stop your subscription at any time, it’s super easy, just let us know and it’s a slam dunk. We won’t try to convince you to stay or pull any shenanigans on you. Of course, anything you have purchased with a “Golden Ticket” remains yours, even if your subscription is canceled. How’s that for a fair deal? Simply click the button below to get your Blues Guitar Unleashed All Access Pass. You can choose monthly billing, or you can choose to save a bit and get a full year’s access for $299. The choice is yours, but don’t delay as this price is subject to change at any time once we are off and running. 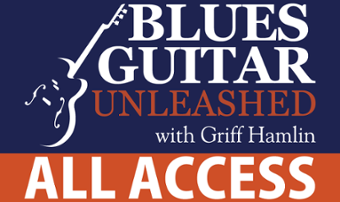 You can get full access to every single lesson, jam track, and course I’ve ever made… plus access to my Practice Generator, Live Workshops, and the Blues Guitar Unleashed Member Forum, for just $29 per month with the new Blues Guitar Unleashed All Access Pass. You’ll have access to all of my courses including: Blues Guitar Unleashed, Acoustic Blues Guitar Unleashed, Strumming And Rhythm Mastery, Beginning Blues Guitar, Classic Rock Guitar Unleashed, Modes Unleashed, CAGED Unleashed, Guitar Theory Made Useful, and tons more. Plus, of course, you’ll get immediate access to all new lessons and courses – and in fact, you’ll get them before anyone else. On top of that, every 60 days you’ll get a “Golden Ticket” which you can use to own any course of your choosing and it will stay yours, even if your All Access Pass expires. You can get it currently for just $29 per month, or $299 per year, but that price may go up any time once this program gets rolling. A $30 per month price would be perfectly reasonable for the amount you will be getting. And, of course, if there are any issues or you don’t like it for any reason, just let us know and you’ll get a refund of your last payment – no questions asked. For yearly memberships we refund pro-rated amounts based on how long you’ve been a member. Sound good? Cool, go here to get your All Access Pass now.